The Young and the Restless spoilers reveal that we’ve got some comings and goings news to pass along. For starters, we’ve got great news for Kelly Kruger fans, as the actress is returning to Y&R in the role of Mackenzie Browning with her first appearance scheduled for November 6. When we last saw Mac, she was determined to find out exactly what happened to J.T. (Thad Luckinbill). Of course, what she doesn’t know is that J.T. met his end at the hands of the cover-up crew. Perhaps Mac will be back with a new lead on “missing” J.T.’s whereabouts. She’ll surely stir up trouble for the cover-up crew, who’s already in a tizzy with Rey (Jordi Vilasuso) on the case and asking questions left and right. The last thing that the cover-up crew needs is for Mac to explode onto the scene and start supporting Rey in his quest to find out what really happened to J.T. Or maybe it’s worse that that; maybe Mac will return with some suspicions of her own. Y&R spoilers say that Nikki (Melody Thomas Scott) will receive a threatening “I know what you did” note. Could Mac be behind that? In other news, Y&R is currently holding auditions for a new role on the show. 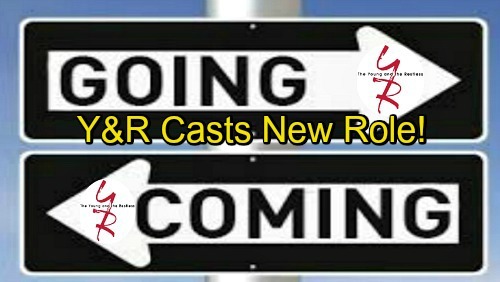 Soap Opera Digest is reporting that Y&R is looking for an actress to play a new character named Mandy. Mandy is described as an African American woman in her early 20s who is a talented songwriter. Mandy is also described as someone who is “starting to discover her unique voice and place in the world.” It sounds like she might be someone who will interact with Devon (Bryton James). Perhaps he’ll sign Mandy as one of his new acts. Whoever ends up filling this new role will begin taping on October 19, so look for Mandy to appear on-screen sometime in early to mid December. That’s it for comings and goings! Stay tuned to the CBS soap and don’t forget to check CDL often for the latest Young and the Restless spoilers, updates, and news.